This is the latest accepted revision, reviewed on 31 October 2018. The text of the Citizenship Clause was first offered in the Senate as an amendment to Section 1 of the joint resolution as passed by the House. The provisions in Section 1 have been interpreted to the effect that children born on United States soil, with very few exceptions, are U.S. citizens. This type of guarantee—legally termed jus soli, or "right of the territory"—does not exist in most of Europe, Asia or the Middle East, although it is part of English common law  and is common in the Americas. Two Supreme Court precedents were set by the cases of Elk v. Wilkins  and United States v. Wong Kim Ark. 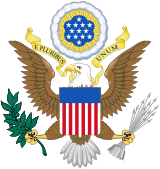 Elk v. Wilkins established that Indian tribes represented independent political powers with no allegiance to the United States, and that their peoples were under a special jurisdiction of the United States. Children born to these Indian tribes therefore did not automatically receive citizenship under the Fourteenth Amendment if they voluntarily left their tribe. Indian tribes that paid taxes were exempt from this ruling; their peoples were already citizens by an earlier act of Congress, and all non-citizen Indians were subsequently made citizens by the Indian Citizenship Act of 1924. For jus sanguinis U.S. citizenship, i.e., citizenship for the children born abroad of U.S. citizen parents, which is established only by congressional statute and not the U.S. Constitution (including its amendments), these restrictions do not apply (e.g., cf. Rogers v. Bellei, 401 U.S. 815 (1971)). [T]he Citizenship Clause of the Fourteenth Amendment expressly equates citizenship with residence: "That Clause does not provide for, and does not allow for, degrees of citizenship based on length of residence." Zobel, 457 U. S., at 69. It is equally clear that the Clause does not tolerate a hierarchy of 45 subclasses of similarly situated citizens based on the location of their prior residence. … [T]he protection afforded to the citizen by the Citizenship Clause of that Amendment is a limitation on the powers of the National Government as well as the States. The Oxford English Dictionary (OED) at "natural-born" defines it as a person who becomes a citizen at birth (as opposed to becoming one later). It lists this definition as going back to the 16th century. OED cites a law of 1695 (Act 7 & 8 Will. III (1696) 478) that states, "A Natural born Subject of this Realm...Who shall be willing to Enter and Register himself for the Service of His Majesty." It also quotes Thomas Jefferson 1776 (in T. Jefferson Public Papers 344): "All persons who..propose to reside..and who shall subscribe the fundamental laws, shall be considered as residents and entitled to all the rights of persons natural born." Blacks Law Dictionary (10th Edition) defines 'Natural Born Citizen' as "A person born within the jurisdiction of a national government." Webster's International Dictionary (3rd edition, 2000) defines "natural-born" as " especially: having the legal status of citizen or subject." ^ Congressional Globe, 1st Session, 39th Congress, pt. 1, p. 597. ^ a b Congressional Globe, 1st Session, 39th Congress, pt. 4, p. 2896. ^ a b c d e United States v. Wong Kim Ark, 169 U.S. 649 (1898). ^ Reyes, Carla. "Naturalization Law, Immigration Flow, and Policy" in Transforming America: Perspectives on U.S. Immigration, Volume 1, p. 149 (Michael LeMay ed., ABC-CLIO, 2013). ^ Epps, Garrett. The Citizenship Clause: A "Legislative History". 60 American University Law Review 331, 352 (2010). "This language [in the Civil Rights Act of 1866] is significant but does not directly demonstrate anything about the 'clear intent' of the Citizenship Clause. First, it is a statute, enacted under the authority of some combination of the Naturalization Clause and the Thirteenth Amendment; the Fourteenth Amendment is a change to the Constitution, creating entirely new rights and providing government with new powers." ^ Afroyim v. Rusk, 387 U.S. 253, 258 (1967). "Therefore, a bill was introduced [in 1818] to provide that a person could voluntarily relinquish his citizenship by declaring such relinquishment in writing before a district court and then departing from the country. The opponents of the bill argued that Congress had no constitutional authority, either express or implied, under either the Naturalization Clause or the Necessary and Proper Clause, to provide that a certain act would constitute expatriation." ^ Immigration and Naturalization Service v. Chadha, 462 U.S. 919, 940 (1983). "It is also argued that these cases present a nonjusticiable political question, because Chadha is merely challenging Congress' authority under the Naturalization Clause, U.S.Const., Art. I, § 8, cl. 4, and the Necessary and Proper Clause, U.S.Const., Art. I, § 8, cl. 18." ^ In contrast to the aforementioned sources, Black's Law Dictionary defines "Naturalization Clause" as being equivalent to the Citizenship Clause. See Epps, Garrett, ed. (2009). "Naturalization Clause". Black's Law Dictionary (9th ed.). St. Paul, Minnesota: West Publishing. p. 1126. ISBN 978-0-314-19949-2. Naturalization Clause. The constitutional provision stating that every person born or naturalized in the United States is a citizen of the United States and of the state of residence. U.S. Const. amend. XIV, § 1. See jus soli. ^ Robert, Pear (1996-08-07). "Citizenship Proposal Faces Obstacle in the Constitution". New York Times. ^ Congressional Globe, 1st Session, 39th Congress, pt. 4, p. 2893. Senator Reverdy Johnson said in the debate: "Now, all this amendment provides is, that all persons born in the United States and not subject to some foreign Power—for that, no doubt, is the meaning of the committee who have brought the matter before us—shall be considered as citizens of the United States ... If there are to be citizens of the United States entitled everywhere to the character of citizens of the United States, there should be some certain definition of what citizenship is, what has created the character of citizen as between himself and the United States, and the amendment says citizenship may depend upon birth, and I know of no better way to give rise to citizenship than the fact of birth within the territory of the United States, born of parents who at the time were subject to the authority of the United States." ^ Congressional Globe, 1st Session, 39th Congress, pt. 4, pp. 2890, 2892-3, 2896. ^ Congressional Globe, 1st Session, 39th Congress, pt. 4, p. 2890. ^ Congressional Globe, 1st Session, 39th Congress, pt. 1, p. 572. During the debate on the Civil Rights Act, Trumbull stated, "The Senator from Missouri and myself desire to arrive at the same point precisely, and that is to make citizens of everybody born in the United States who owe allegiance to the United States. We cannot make a citizen of a child of a foreign minister who is temporarily residing here. There is a difficulty in framing the amendment [to the Act] so as to make citizens of all people born in the United States who owe allegiance to it. I thought that might perhaps be the best form in which to put the amendment at one time, 'That all persons born in the United States and owing allegiance thereto are hereby declared to be citizens'; but upon investigation it was found that a sort of allegiance was due to the country from persons temporarily resident in it whom we would have no right to make citizens, and that that form would not answer." ^ Congressional Globe, 1st Session, 39th Congress, pt. 4, pp. 2891-2. ^ Congressional Globe, 1st Session, 39th Congress, pt. 4, p. 2891. During the debate on the Amendment, Conness declared, "The proposition before us, I will say, Mr. President, relates simply in that respect to the children begotten of Chinese parents in California, and it is proposed to declare that they shall be citizens. We have declared that by law [the Civil Rights Act]; now it is proposed to incorporate that same provision in the fundamental instrument of the nation. I am in favor of doing so. I voted for the proposition to declare that the children of all parentage, whatever, born in California, should be regarded and treated as citizens of the United States, entitled to equal Civil Rights with other citizens." He further added that "they [the Chinese] all return to their own country at some time or other". ^ Congressional Globe, 1st Session, 39th Congress, pt. 4, pp. 2891-2. Cowan expressed concern over the prospect of a state not being able to determine its own citizens. In particular, he identified two groups that he felt were unsuitable for citizenship but would have such bestowed upon their children by the Amendment: Chinese and Gypsies, the latter of which he described thus, "who owe to her [Pennsylvania] no allegiance; who pretend to owe none; who recognized no authority in her government; who have a distinct, independent government of their own ...; who pay no taxes; who never perform military service; who do nothing, in fact, which becomes the citizen, and perform none of the duties which devolve upon him, but, on the other hand, have no homes, pretend to own no land, live nowhere, settle as trespassers where ever they go." He subsequently cautioned against adopting the proposed Amendment, "Are these people, by a constitutional amendment, to be put out of the reach of the State in which they live? ... If the mere fact of being born in a country confers that right then they will have it. ... Therefore I think, before we assert broadly that everybody who shall be born in the United States shall be taken to be a citizen of the United States, we ought to exclude others besides Indians not taxed, because I look upon Indians not taxed as being much less pestiferous to society than I look upon Gypsies." ^ Congressional Globe, 1st Session, 39th Congress, pt. 4, pp. 2893-4. ^ Congressional Globe, 1st Session, 39th Congress, pt. 4, p. 2893. Senate Judiciary Committee Chairman Lyman Trumbull, participating in the debate, stated the following: "What do we [the committee reporting the clause] mean by 'subject to the jurisdiction of the United States'? Not owing allegiance to anybody else. That is what it means." He then proceeded to expound upon what he meant by "complete jurisdiction": "Can you sue a Navajoe Indian in court? ... We make treaties with them, and therefore they are not subject to our jurisdiction. ... If we want to control the Navajoes, or any other Indians of which the Senator from Wisconsin has spoken, how do we do it? Do we pass a law to control them? Are they subject to our jurisdiction in that sense?. ... Would he [Sen. Doolittle] think of punishing them for instituting among themselves their own tribal regulations? Does the Government of the United States pretend to take jurisdiction of murders and robberies and other crimes committed by one Indian upon another? ... It is only those persons who come completely within our jurisdiction, who are subject to our laws, that we think of making citizens." ^ Congressional Globe, 1st Session, 39th Congress, pt. 4, pp. 2894-5. ^ Today British nationality is defined in statute, which supersedes the common law. ^ Urofsky, Melvin I.; Finkelman, Paul (2002). A March of Liberty: A Constitutional History of the United States. 1 (2nd ed.). New York, NY: Oxford University Press. ISBN 0-19-512635-1. ^ Birthright Citizenship Under the 14th Amendment of Persons Born in the United States to Alien Parents (PDF) (Report). Congressional Research Service. August 12, 2010. p. 15 (page 18 of the PDF). Archived from the original (PDF) on 2010-12-03. ^ Vance v. Terrazas, 444 U.S. 252 (1980): "As we have said, Afroyim requires that the record support a finding that the expatriating act was accompanied by an intent to terminate United States citizenship." ^ Slaughterhouse Cases, 83 U.S. 36 (1873). ^ "citizen". Black's Law Dictionary (10th ed.). Thompson Reuters. 2009. Congressional Globe (1866). "1st Session, 39th Congress, pt. 4". Debates and Proceedings, 1833-1873. pp. 2881–3840. covering the dates of May 29 to July 16. Ho, James C (2007-03-10). "Can Congress Repeal Birthright Citizenship?". The Los Angeles Times. Eastman, John. "From Feudalism to Consent: Rethinking Birthright Citizenship", Heritage Foundation, Legal Memorandum #18 (2006-03-30).